2. The Knicks decided not to keep Kurt Rambis around, and instead hired Jeff Hornacek—whom Phil Jackson reportedly empowered to run the offense however he wanted to—to coach the team. 5,878. The team signed Derrick Rose and Joakim Noah. Unfortunately, a new report from ESPN brings some bad news. Jackson is apparently already having some second thoughts about giving Hornacek a long leash, and is annoyed at how rarely the Knicks are running a triangle offense. The Knicks are currently 2-4 and and rank 14th in offensive rating, a full 10 spots higher than where the offense ranked last season. It’s only been six games, but maybe the Knicks really are playing worse than they should be, and maybe there are some tangible deficiencies in the offense that need fixing. What should worry Knicks fans much more than a 2-4 record is the fact the we aren’t even halfway through November yet and Jackson is already letting his dusty, triangle-obsessed id out of its cage. Jackson has been calling the shots for more than two full seasons now, and all his insistence on reviving the triangle offense in New York has led to is a pile of losses. 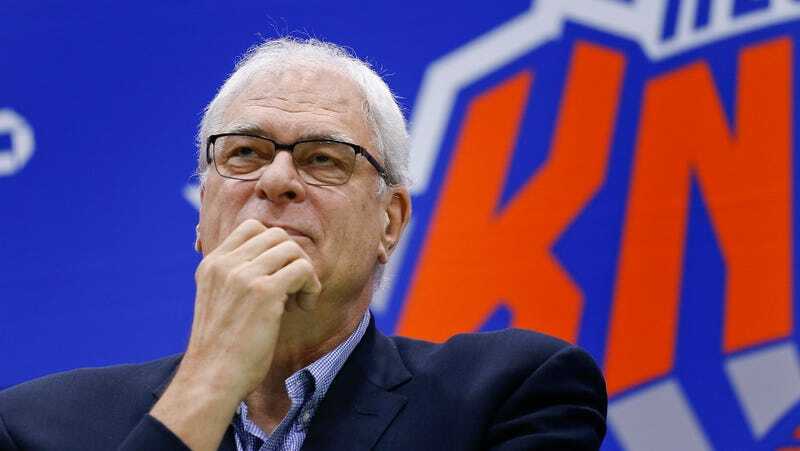 He fired Derek Fisher after determining that Fisher wasn’t suited to properly run the triangle, and then reportedly tried to keep Kurt Rambis, literally one of the worst coaches in NBA history, around to be a sock-puppet coach. And now, the autonomy that Hornacek was reportedly granted in the offseason hasn’t even survived 10 games. Let’s remember that Jackson has never expressed many reasonable thoughts when it comes to his desire to see the triangle reinstated as the dominant offensive system in basketball. Back in 2015, he made it apparent that his wish to revive the retrograde offense had just as much to do with securing his legacy as a basketball genius as it did with actually winning games. If one were to make a list of reasons for Knicks fans to be pessimistic about their team’s prospects going forward, Jackson might be No. 1.